It is a mistake to assume that events far apart in time are thereby separate. All things are connected as in the finest web of a spider. The slightest movement on any thread can be discerned from all points in the web. We live in a time of spiritual searching, where knowledge from the past is sought as eagerly as the experience of the new and unknown. In the course of that searching, our era has seen many of the great traditions of spiritual wisdom come to life around us once more, reviving what may be forgotten in the mind but remembered in the soul. We may feel strongly moved by karmic connections with such knowledge, seeking it out with an intuitive urgency that is drawn from such inner memories and their echoes. Knowledge from the past reminds us that we have lived before just as it speaks of what has enduring value. 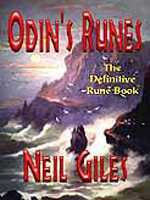 Foremost amongst the ancient traditions that have been born again is that of the Vikings and the runes. 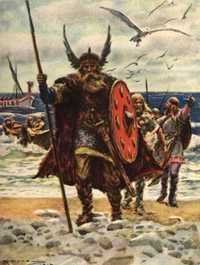 Many of us have had the joy in childhood of reading the Scandinavian legends, the tales of Odin, Loki and Thor. They were the gods of these early sea-faring folk whose world was born from the meeting of fire and ice. These ancient gods were known as the Aesir. They ruled the Northern climes from their home in Asgard, leading lives filled with wondrous adventure, poetry and feasting. They fought with their traditional enemies, the frost giants and awaited the day known as Ragnarok, the last day of gods and men when a conflagration of flood and fire would sweep across the final battle of good and evil, leaving only devastation in its wake. The earth would then lie ruined, awaiting the coming of Baldur, the fair-faced shining god of the Aesir, whose resurrection and return from his sojourn in the underworld would bring redemption and new life. Such joy as you might have found in these half-remembered tales of childhood might then have been renewed in adult life with the publication of Ralph Blum's Book of Runes. This commercially successful divination kit helped to bring runic awareness back into public consciousness, though there are many works now that can aid both reader and student in catching the flavour of the runes with more accuracy and clarity. If this has been your story then, whether you know it or not, you are already steeped in an important tradition of western magic and spirituality. The runes may have come to you by other means, without the stories to start you on the way. A set of runes is an item of considerable magical power and, as such, it will present itself in a moment of need as an unexpected gift, an intuitive purchase or an accidental find. Whatever the case, you might have developed a passion for them, working with them regularly or even professionally for a while. Or, you could be just using your runes from time to time, idly examining future possibilities, often startled by their accuracy. You might have found the runes but your initial interest could have waned and your set now sits gathering dust on the shelf, confusing and somewhat mysterious. Or, the runes might not yet have come into your life. They may be a soul memory, latent, hidden in the unconscious. Yet the ancestors who walked the path of rune magic long ago will have written those patterns in your unconscious, inscribing them in the earth of your body. Thus, when and if a set of runes does come into your life, you can use them to awaken the magic that lies within you.